We have a beautiful house, The traditional housing of the city was inspired by the colonial model. They were houses that occupy almost a complete block. It is almost a fact that some materials and techniques used in the construction of the colonial houses of Salento no longer exist as a consequence of modernism and the elaboration of other products for the market. We are located in the heart of Salento, one block from the square, on the real street, where all the commerce of the town is based, one block from the plaza, on the real street (shops and restaurants), near the Salento viewpoint, located in the heart of the town. 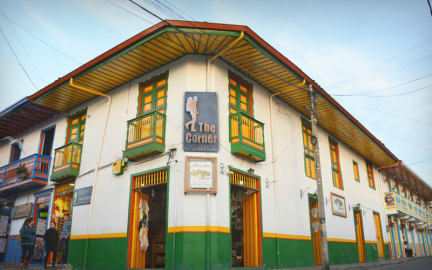 Our entrance is full of Colombian craft stands where everything is handmade by peasants of the region. Check in from 1pm to midnight. Reception open from 6am to midnight. Hier twee dagen verbleven. Top locatie en kleinschalig met een goede sfeer. Behulpzaam personeel, warme douches en goede bedden. En dat allemaal voor een lage prijs.